Posted August 13, 2015 & filed under Press, People. Whitney and his father, retired electrical engineer Wilbert Whitney, were honored for their contributions to the engineering profession at a ceremony at Emera Astronomy Center. ORONO, ME – Douglas W. Whitney, AIA, was inducted into the University of Maine’s Francis Crowe Society as an honorary member during an August 12 ceremony at its Orono, Maine campus. Doug Whitney, who is President/CEO of WBRC Architects· Engineers, is the first architect to be inducted to this society. 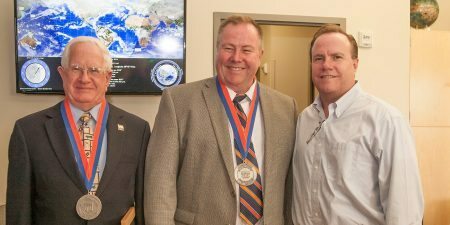 He was joined by his father and fellow inductee, Wilbert Whitney, who attended UMaine and is a retired electrical engineer who worked on several continents during his career. Nearly 20 members of the Whitney family were also in attendance. The Francis Crowe recognizes UMaine engineering graduates and others who have made considerable contributions to the engineering profession. The society is named in honor of Francis Trenholm Crowe, who earned a degree in civil engineering from the University of Maine in 1905 and was chief engineer of the Hoover Dam . In addition to honoring graduates and industry professionals, the Francis Crowe Society has also named a variety of honorary inductees, including John Glenn, Astronaut, Senator, and Engineer, and Adam Savage, TV Personality and co-host of Myth Busters. 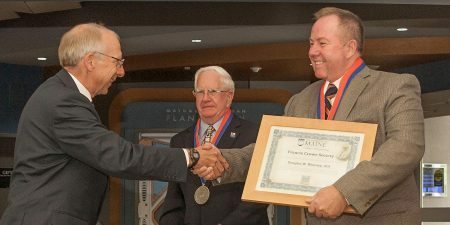 Dr. Humphrey presided over the induction ceremony, along with co-host Patricia Cummings, UMaine’s Associate Vice President for Development & Alumni Relations. Wilbert “Wil” Whitney attended University of Maine for several semesters on the GI bill following military service during the Korean War. He earned a BS in Electrical Engineering from Northeastern University in 1967. He enjoyed a distinguished career as an electrical engineer with AT&T, Sylvania, and Central Maine Power, serving on projects as far away as South Africa and the Middle East. Two other members of the Wil Whitney family, son Mike and grandson Daniel, are also members of the Francis Crowe Society, having both graduated from the University of Maine with degrees in Engineering Physics. Doug Whitney is an award-winning architect who has been a principal at WBRC since 1989, after joining the firm in 1980 soon after graduating from Syracuse University with a Bachelor’s in Architecture. After designing many of Maine’s signature buildings, including EMMC’s Irving Kagan Building, Whitney led the creation of WBRC’s Florida branch in Lakewood Ranch in 2002. Under his watch, it has grown significantly, with projects across 17 states and serving regional and national clients, including Universal Health Services (UHS), Bealls Outlets, Verizon Wireless, and Validus. He was named President/CEO of WBRC in 2013. Over its 113 year history, WBRC Architects· Engineers has been a part of over 100 projects on the University of Maine’s flagship campus in Orono. More recent projects include Emera Astronomy Center, the Offshore Wind Laboratory at the Advanced Structures and Composites Center, Shawn Walsh Hockey Center, and Buchanan Alumni House. WBRC’s first UMaine design projects go back over a century, beginning with Lord Hall and Stevens Hall. The firm also employs several graduates of the University of Maine’s School of Engineering. In addition to supervising the construction of the Hoover Dam, Francis Trenholm Crowe (1882-1946) also was involved in the construction of 18 other major dams in the United States, making farming possible and profitable across vast sections of the U.S., including the Great Basin, California’s Central and Imperial Valleys, and Central Arizona. Crowe pioneered two practices that are crucial to the construction of large dams. The first was a pneumatic delivery system to transport concrete and the second was a system of overhead cables to allow the pneumatic concrete to be pumped at any point on the construction site. He earned the nickname “Hurry Up Crowe” for his sense of urgency in keeping projects moving, and proved its accuracy by finishing the Hoover Dam two years early, and under budget.